Series 1869 Legal Tender bills are known for their amazing color scheme known. Because of the vivid colors they are nicknamed rainbows and if you say you have a rainbow people will know what you are talking about. The series 1869 Legal tenders were issued in $1.00, $2.00, $5.00, $10.00, $20.00, $50.00, $100.00, $500.00 and $1000.00. The $1000 is impossible to collect with only two known and one is sitting in the Federal Reserve Bank of Chicago. This is such a beautiful series that if I ever get tired of nationals I would like to put together a nice set. All Series 1869 Legal Tenders are signed by Francis Spinner, a signature instantly recognizable to any collector. Denominations over $20 are extremely rare and are quite valuable. This vignette at left is Christopher Columbus making sight of land... His gaze could as well be expressing admiration for the beautiful bank note he finds himself apart of. The 1869 $1.00 legal tender is the most affordable note in the rainbow series. There are over 1000 known and they are readily available in all grades. A nice mid grade example will cost $700 to $900. The possible range of appraisal values would be from $200 for a limp rag to $8000 in the highest grade. The 1869 $2.00 bill has Jefferson on the left and the US Capital building as the central vignette. The back is rather plain compared to the $1.00 in the series. There are several signature combinations on this issue one of which is much rarer than the rest. Contact me with pictures of your note to see if you have the rare variety. The $2.00 note is also readily available with a nice mid-range note valued at about $1000 to $1200. A full range of values for this note would be $300 for a mess and over $10,000 for an uncirculated example. The 1869 $5.00 bill is nicknamed the Woodchopper or sometimes Pioneer Family. I wonder if these two items were put together because Andrew Jacksons nickname was Old Hickory. I don't know... but it sounds plausible to me. The 1869 $5.00 bill is a readily available note with around 600 known to exist. That is fewer than both the $1.00 and $2.00 in the series however. A nice mid-grade example can be had for $750 to $900. A full range of values would be $300 to over $10,000 for a superb Gem example. 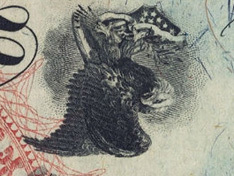 Behold the jackass note, the 1869 $10.00 bill The note was so named because of an interesting characteristic of the eagle at the bottom center. If you turn the note upside down the eagle vignette looks like a jackass. See the image above. I wonder if this was an inside joke in the engraving department at the Bureau of Engraving and printing. In any case, the nickname and the over all beauty of the note all make for a great collectible. With fewer than 500 known to exist the heavy collector demand these notes can get pricey. A nice mid grade example will run about $1000 to $1250. A full range of a values on this note would be between $700 and $18,000 for a pristine well centered note. The 1869 $20.00 bill is where the scarcity starts to become a factor. With fewer than 200 known to exist these notes are not common. The design is similar to the others but this note does have the broadest white field tinted blue so the effect is the most striking here. This note and the rest of the series the blue of the rainbow is on the right... I wonder if this was a choice with meaning or it just happened to me that way. I really like the backs on this note. It would come to be replaced because they thought this back design was easy to counterfeit. A mid-grade example of this note would appraise between $2000 and $2500. A full range of values would be from $1000 to just south of $60,000 for a perfect uncirculated example. The 1869 $100 dollar rainbow notes are incredibly beautiful and most collectors never get to even hold one. With fewer than 30 known to exist they are only collectible for a tiny fraction of the collecting community. A medium grade example would have a value of between $20,000 and $30,000. In high grades these notes have achieved over $200,000.